The cobra under the child Baba’s blanket story is debunked by Sai’s two sisters, Venkamma and Parvatamma and Schulman found that, for every claim or story about Sai Baba, there are conflicting versions. 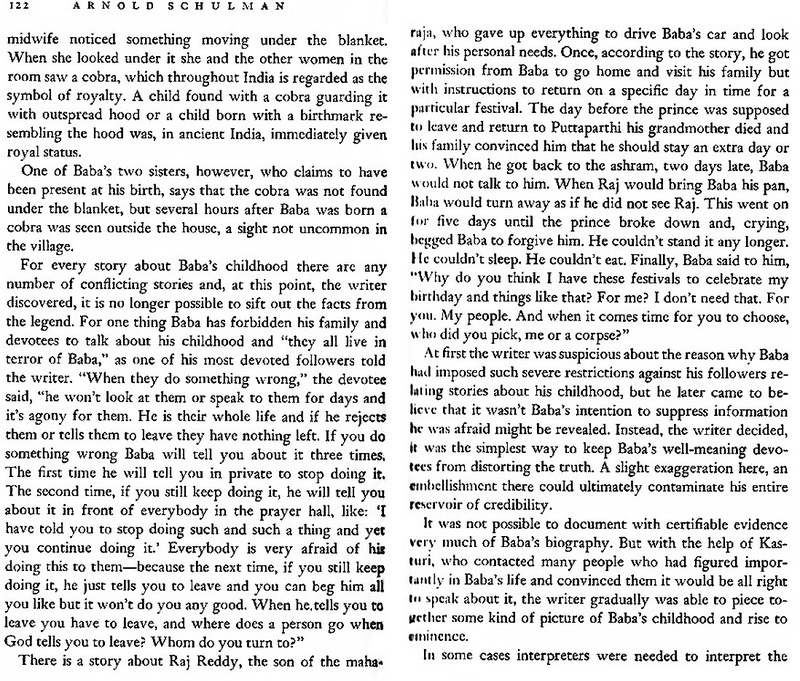 This should be sufficient to cast utmost doubt on most of Sathya Sai Baba’s alleged ‘Divine childhood’. This entry was posted on May 11, 2015 at 1:32 pm	and is filed under Sathya Sai Baba. Tagged: Arnold Schulman, cob ra, Parvatamma, Venkamma. You can follow any responses to this entry through the RSS 2.0 feed. You can leave a response, or trackback from your own site.